As we are in the era of globalization, more and more international students are coming to Korea every year to study. Currently, 179 universities from 42 countries have cultural exchange agreements with Dongguk University. Students from these universities are adjusting to the new environment. Some have made a number of clubs to exchange cultures, and others have made study groups or meetings to have fun. The Post interviewed some exchange students at Dongguk who are pioneering their own ways to make the best of their time in Korea. ▲ The members of the English (Food) Club are enjoying their meal of the day. In the English (Food) Club, 15 international students gather together to host a presentation about their home countries and share their native foods to make the Chungmuro dormitory a more suitable for global dwellers. In March 2016, a Kazakhstan exchange student, Zhanna Ordabayeva (Junior, Computer Science and Engineering) currently living in Chungmuro dormitory, came up with the idea of socializing with the people in her dormitory by forming a club. “Even though we were living on the same floor, we barely knew each other,” she remembered. Since then, every Thursday night on the 4th floor of the Chungmuro dormitory, 15 international Donggukians from Romania, Kazakhstan, Japan, and South Korea decided to group together as a club where students share their homeland’s countries in English to improve their English skills. Anyone living in a faraway country can feel home-sick and lose their own motivation. Nonetheless, in the name of “International Donggukians,” these students are able to overcome these hardships by uniting and sharing. The English (Food) Club is not only about giving presentations and sharing foods. In their own ways, such as the Kazakhstan students who introduced their country by wearing their uniforms and performing their traditional dances and the members playing the drinking game of “three-six-nine” in each member’s native language, they are bringing harmony and unity in their own global society. ▲ The students at the Language Cafe are having a discussion. 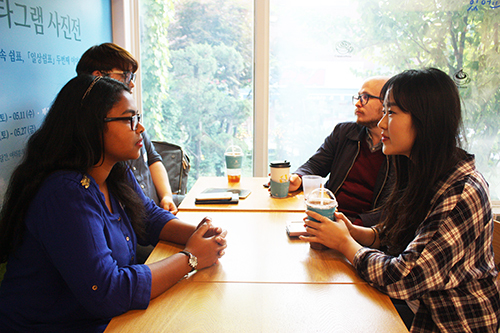 Every Mondays, Wednesdays, and Fridays, the “You are here Café” at Hongik University is filled up with an exotic yet friendly atmosphere on its second floor. It is a social meeting between international and local people in Seoul, hosted by “Talk to me in Korean,” an online Korean lecture company. The participants of this meeting usually gather at around 6 P.M., and they engage in a friendly conversation in Korean. On Friday night, they play board games including traditional Korean folk games. When a new-comer first arrives at the second floor of the café, the host named Mark will greet and provide a name card. The ambience of the meeting is very casual, and once the name card is on their shirts people are free to join any table and start practicing Korean. At the end of the meeting at around 10 P.M., they often dine out together to try out some traditional Korean delicacies. Many different international students seemed to have their own unique motivations for joining the meeting. While Kenny Tree (Senior at Yonsei University, Mathematics & Statistics) from the USA, who came to Korea and has only been here only for two months, wanted to increase his Korean proficiency, Nick Theodoracatos (Sophomore at Yonsei University, Mechanical Engineering), also from the USA, was in for both learning and socializing. “I think when you learn a language it is more than just reading and writing. You need to know how to speak, and the best way to speak is to meet friends and experience their culture,” he said. The subject of the conversation is never fixed and ranges from personal interests to talk of the town. Mark, the host, makes sure to diminish any awkwardness among the tables by regularly spending some time for the participants to introduce themselves briefly. “People here are good natured and were very pleasant to talk to. Mark is a very funny and genuine man,” said Cassandra Alligood (Senior at Konkuk University, English) from the States. Meanwhile on Fridays, the meeting is also an ideal place for trying out traditional entertainments of Korea. Although not as intense as the battle between Lee Sea-dol and Alpha-Go, the students seemed to enjoy their game of Baduk, as well as creating a warm Chuseok atmosphere with a round of “Go-Stop.” In addition, Adam Chmeil (Graduate, Industrial Engineering) from Czech Republic, mentioned that his favorite game “Mafia,” a traditional university amusement. As there is not any specific rules or guidelines for signing up, any willing newcomer can simply walk into the cafe and blend in with the rest. All participants are free to leave at any time or skip a day if they are not in the mood for conversations. However, the pleasant faces of the members hinted that there will not be any noticeable absence as they continue to stay the way they meet and talk. “I have been to a lot of language clubs and this is my favorite. I can study language the way I want since the atmosphere here is free and delightful,” said Nick about the meetings. 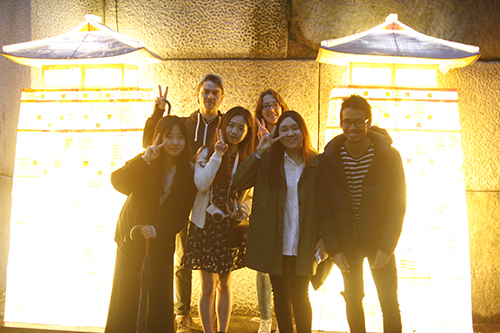 ▲ The students of Sayul went to Gyeongbokgung Palace. While engaging in cultural exchanges and studying groups do help the international students in different senses, sometimes, it is the best to simply catch a good meal and enjoy what Korea has to offer. 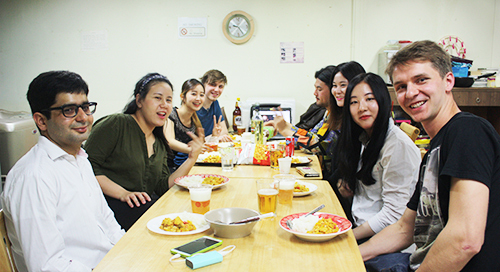 Sayul, or “Say Your Soul,” is a meeting where both Korean and international students from Seoul gather together to eat and have fun. It provides opportunities for members to socialize with people of different nationalities and experience different forms of entertainment on the streets of Seoul. On the 6th of May, Sayul visited Gwangjang Market and the lotus lantern festival at Cheonggye Stream to take a look at one of the most popular places for nightlife in Seoul. Despite the depressing weather, international and Korean members never seemed to get tired as they drank makgeoli and made wishes before tossing coins into the stream. At the market, the members sat down on plastic chairs in the market, literally situated in the middle of an open passage. Just like an open-kitchen restaurant, they watched Jeon (Korean pancakes) being mixed and fried while they sipped makgeolli from their bowls. “We always drink our favorite drink, Makgeolli, in this group,” said Enzo Smith (Graduated at Hanyang University, International Studies). Their next destination was Cheonggye Stream where the Lotus Lantern Festival was being held. Although it was regular sight-seeing, simply having a chat with the members of the club about their countries and their experienced created a unique experience for everyone as they walked along the path lit up by the lanterns floating on the stream.